NASA's solid rocket booster recovery ship Liberty Star closes in on the shore with a spent rocket alongside. A NASA sea ship that for 30 years retrieved space shuttle boosters after they splashed down in the Atlantic Ocean now has a new mission to serve the Merchant Marines. 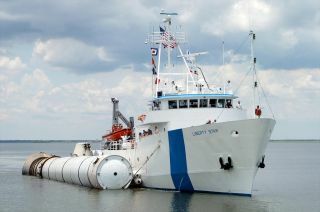 On Tuesday (Aug. 21), NASA signed a memorandum of understanding with the U.S. Transportation Department's Maritime Administration (MARAD) to transfer the agency's solid rocket booster recovery ship, MV Liberty Star, to the National Defense Reserve Fleet to be used for training at the U.S. Merchant Marine Academy in Kings Point, NY. "Liberty Star served NASA well during the space shuttle program," Robert Lightfoot, acting associate administrator for NASA, said in a statement. "We know it will greatly benefit the Kings Point midshipmen, and we're proud that Liberty Star will continue to serve the United States with distinction." The Liberty Star, which was one of two vessels that were designed to recover the shuttle's side-strapped solid fuel rockets, has been in service to NASA since 1981. It and its sister ship, the Freedom Star, would each track one of the twin solid rocket boosters (SRBs) that separated from the shuttle after about two minutes of flight, rendezvous with it at sea, and then tow it back to port for its reuse by the space shuttle program. During its three decades recovering rockets, the 176-foot long (54 meter) Liberty Star was also used to tow shuttle external fuel tanks, which were loaded onto a barge, from their assembly facility in New Orleans to NASA's Kennedy Space Center in Cape Canaveral, Fla. The dual diesel engine ship was also used to occasionally support research operations for the National Oceanic and Atmospheric Administration and several universities. In the past year, Liberty Star participated in recovery tests for NASA's Orion crew capsule, which is being developed to take astronauts to an asteroid and ultimately Mars. The ship supported the Crew Module Recovery Attach Fitting Test (CRAFT) to help develop the equipment to recover an uncrewed Orion flight test capsule after splashdown. Most recently, Liberty Star sailed in conjunction with the May 22, launch of the first commercial spacecraft to lift off for the International Space Station. As the Space Exploration Technologies (SpaceX) Dragon capsule lifted off atop the company's Falcon 9 rocket, Liberty Star was used to track the booster's flight using NASA diagnostic radar systems. With the shuttle program's end last year however, NASA no longer needed booster recovery vessels. Although the agency has plans to launch the shuttle-legacy rockets in the coming years with its new heavy-lift vehicle, called the Space Launch System, they will be treated as expendable and allowed to sink into the ocean. Liberty Star, in its role at the Merchant Marine Academy, will be used as a training vessel, providing an opportunity for the Kings Point midshipmen to have access to a ship with dynamic positioning, modern towing capabilities and other features that will expand their instruction. NASA will continue to have access to Liberty Star if the agency requires its use and it is available. "This agreement is a win-win for both Kings Point and for NASA," David Matsuda, Maritime Administrator, said in a statement. "The ship's high tech equipment and real world capabilities closely mirror what graduates will see entering the maritime work force." Liberty Star is currently scheduled to depart the Kennedy Space Center on Sept. 10 and arrive in New York on Sept. 14. NASA is working on identifying a suitable new use for Freedom Star.